For the next interview in the StockTickr Interview Series (RSS feed), I spoke with Andrew Allen from Humble Money. Andrew is an independant day trader and has a chess background. Read on for a great interview and learn more about how Andrew trades, more about his chess background, and how he got started trading. Support for TradeStation has always been a frequent request from users and we’ll have support very soon. TradeStation users will enjoy some very nice integration with StockTickr. Once configured, TradeStation will essentially keep your trading journal for you automatically in REAL TIME. Whether you’re a strategy trader or a discretionary trade, you’ll also have access to the best performance analysis statistics available that go far beyond what’s available within TradeStation. You won’t have to lift a finger. This will be some of the nicest integration of any broker we support. Do you auto-trade? You’ll be able to get a real time view of the trades your TradeStation automated strategy has taken from any web browser. Imagine if you’re away from your trading computer and you want to check how your ATS is doing. 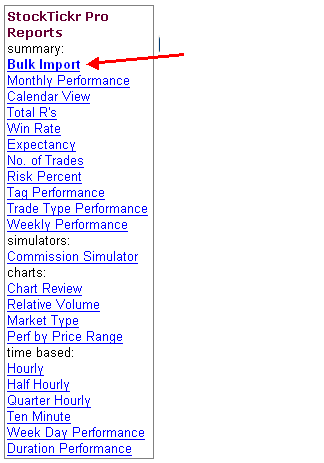 You can just log into StockTickr to see how it’s performing. Are you interested in beta testing? In exchange for your help you’ll get access to StockTickr at a significant discount. Please contact us using this form and include the type of instruments you trade, whether you hold positions overnight, and whether you do any auto trading. Beta Testers Needed – Do You Use Real Tick or MB Trading? Do you use Real Tick or MB Trading as your broker? If so, we’d love to have you test out the StockTickr plugin that we created that supports these two brokers. You’ll get an extended free trial to StockTickr and a very significant discount off the standard subscription rate. Trade Type Recognition – the plugin automatically determines the type of trade you made – buy, sell, scale in, scale out, sell short, or buy to cover. Intelligent Default Stops – the plugin uses an algorithm to determine a default stop based on recent trades in your journal. Of course, you can override the suggested value. Duplicate Trade Avoidance – the plugin queries your journal and avoids entering duplicate trades. This allows you to run the plugin more than once a day. Default Tags – you can customize the default tags that are applied to each trade in your journal. StockTickr Chart Review – StockTickr will generate charts for all your trades with your entry and exit points plotted right on the chart. Saves You A Lot of Time – you know how important keeping a trading journal and capturing charts of all your trades is – StockTickr does this for you automatically! Optionally enter your entire trading history, not just the most recent day’s trades. If you’re interested in testing these plugins for us with Real Tick or MB Trading, use the contact form and select Beta Program from the drop down. Include which broker you use and a brief description about yourself and we’ll send you the links for the plugins.